ANKARA, Turkey - For the past 13 years, Recep Tayyip Erdoğan’s Justice and Development Party, also known as "JDP or AK in English and AK PARTİ or AKP" party had always won a majority in every Turkish election. Erdoğan initially won a historical victory in the 2002 elections and became the AKP’s chairperson. The key elements that contributed to the AKP’s victory were the economic depression which plagued Turkey, the failures of predecessor coalition governments, as well as a necessary 10 percent electoral threshold which Turkish political parties have to pass to have the floor at The Grand National Assembly of Turkey (TBMM). Erdoğan’s AKP won 363 of 550 seats in the National Assembly where 45 percent of the popular vote was not reflected in the National Assembly because of the electoral threshold. However, in the most recent elections held on 7 June 2015 the AKP’s iron clad reign of power seems to have faltered despite the fact that they won 40 percent of the votes, the AKP was unable to reach the number of Parliament Members (MP) required to form the ruling government which has forced them to form a coalition with one of its rivals. Since its establishment, and its first victory in 2002, AKP earned the trust of many people from varying backgrounds who had previously either supported AKP or another party such as the People's Democratic Party (HDP). Erdoğan’s first speech after his first victory also won a general approval from almost everyone in the country as well as his speech after the second general election he won. “You voted for the democracy to function more efficiently. You voted for a transition into a democracy from a democracy which could not govern. It is your decision. You carried out the principle, like Ataturk said, ‘Sovereignty unconditionally belongs to the nation’,” he said on his speech after November 3, 2002 general election. Erdoğan emphasized unity of Turkey’s people in his speech after the general election on 23 July 2007 election which continued to receive approval from all parties. “I am calling out to the people who did not vote for my party. I understand the message you gave us in your votes. Please feel comfortable. Your vote is important to us no matter who you voted for. Please be at ease; we will continue to protect our nation’s consignment up to the end like we always did,” he said. In the years following the 3 November 2002 election, AKP and Erdoğan have won all parliamentary elections and formed the government singly, in addition to general local elections and his presidential run until this past 7 June 2015 election cycle. Compared to prior elections, the June 7th parliamentary elections turned out to be more democratic as more than 95 percent of the votes were reflected to the Great National Assembly of Turkey. A new party, People’s Democratic Party (HDP) contested in the election as a party unlike its predecessor, Peace and Democracy party (BDP) did in the previous elections in where it participated independently to bypass the 10 percent electoral threshold. Contrary to several pro-government polls, HDP fared way better than expected and won 80 seats with 13 percent of the vote, which also collapsed AKP’s plans for continuing to form and run the government alone. An image showing the pool results from 4 different poll companies prior to June 7th election. Only one of those polls showed HDP passing the electoral threshold. AKP lost the support it had constantly received from Turkey’s people for 13 years in June 7th election. In addition to HDP’s swift popularity in Turkey, AKP also lost support because Mr. Erdoğan was no longer the chairman of the party since being elected as president. Additionally, the corruption investigations that were launched in December of 2013, which implicated many government officials as well as businessman with close ties to AKP which many citizens felt were improperly concluded by government. Mr. Erdoğan and his team blamed Fetullah Gulen, an Islamic cleric leading the Hizmet Movement, for forming a parallel state within Turkish government. He also blamed Mr. Gulen for an attempt to overthrow the government by fomenting conspiracies which included in their opinion false allegations of corruption by close supporters and allies of the AKP. Mr. Erdoğan’s unusual political stand after being elected as a president is another key factor in AKP’s marginal victory. Although, as president he was mandated to remain impartial regarding the political parties that comprise the parliament, it has been problematic because he hascontinued to covertly and sometimes overtly support AKP. Critics claim that Erdoğan support for AKP has come to a point where he has begun to act more like a member of AKP than the president of Turkey. Voters indicated that the AKP’s post-electoral agenda and Mr. Erdoğan’s desire to amass a power base that would effectively make him impervious to usurpation were the primary reasons why they switched their support to other parties. The parliamentary system in Turkey requires political parties to form a single government with majority, or in coalition with another party within 45 days after any election. Following the June election neither the Republican People’s Party (CHP), Nationalist Movement Party (MHP), or Democratic People’s Party (HDP) wanted to form a coalition with the AKP. Ideologically, none of the parties share an affinity for each other; however the leader of the MHPmade it clear that in addition to the AKP, they will not be involved in a coalition with HDP as well. Without AKP, the only option is a minority government, which could not last long in Turkey’s dynamics government. Despite their initial position, in the intervening days following their pronouncement, party leaders have softened their language and started preparing protocols for possible coalitions. Mr. Erdoğan expressed in an earlier meeting that he would meet the leaders of all political parties prior to designating one for the Prime Minister position. “First, I will assign the chairman of the party which received the highest vote. If he cannot form the coalition, I will assign the chairman of the party which received the second highest vote,” he said. With only days left to form a government, little has been accomplished in TBMM. 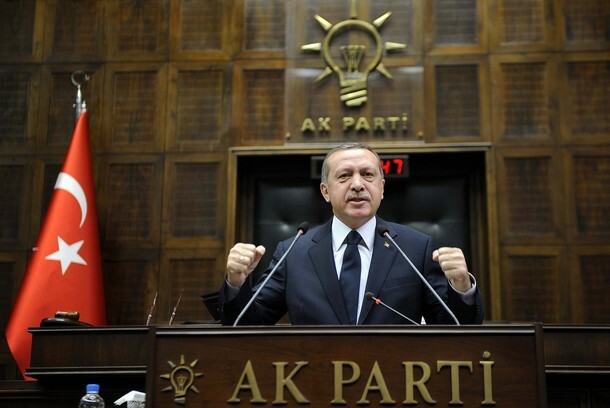 An early election, or in Mr. Erdoğan’s words, a re-election is a close option, not a surprise.